"Supporting a trustworthy charity such as WellLife Network helps to enhance our reach adn raise awareness and funds for a worthy cause and the community at large." WellLife Network joined forces with the New York Islanders and a dynamic mix of key community advocates on November 4, 2018 to raise awareness and funds for New Yorkers faced with developmental disabilities, mental health and addiction challenges. New York Islanders' Sparky the Dragon led the charge as more than 300 runners gathered at Eisenhower Park in Westbury, New York for the second annual WellLife Network 5K Run/Walk. The Run culminated a six month agency-wide wellness campaign to improve overall staff fitness through regular exercise and adopting a healthier diet. Together, more than 40 staff, friends and family members raised more than $25,000 for WellLife Network's essential programs. Some of those programs offer counseling and referral services to survivors of domestic violence on Long Island and provide community education and prevention programs for children and adults coping with addiction recovery issues. WellLife Network would like to recognize the key corporate partners and private advocates who made the 5K Run/Walk such an outstanding success. A very special thank you to: ABT Appliance Brokers & Traders; All Biz, Inc.; Thomas A. Blumberg; Economy Fuel Oil, Inc.; Four Seasons Enterprises, Inc.; Gallagher; Gannon Electrical Corp.; Surujdai Gopaul and Rohan Mohan; HSBC Charitable Foundation; Imperial Dade; Bense J. Kopgram; Moveco Moving Services; Netsmart; Premier Supplies; The Ray-Bloch Stationery Co., Inc.; SavMor; Marvin Sperling; Sterling Sanitary Supply, Corp.; Tonerprice.com; Tristate Apartment Furnishers; Sherry and Dirk Tucker; Urban Architectural Initiatives, RA, PC; and VitaCare Long Term Care Pharmacy. WellLife Network would also like to recognize the generosity and support of the New York Islanders for sending their mascot, Sparky the Dragon to entertain the runners. WellLife Network presented some exciting prizes to our board and staff. Award-winning participants included: our amazing WellLife Network board member Steve Bernstein–for securing the largest donation and runner up for most money raised; Elizabeth Matthews, Vice President, Administration–for raising the most revenue and recruiting the most donors; and Jianwei Chen, Controller–for recruiting the largest running team. We also want to thank our staff who created running teams to help our fundraising efforts. Team included, The Islanders, led by Natashia Crump; The Closers, organized by Jianwei Chen and Care Management Long Island led by Florence Engoran. We also recognize our dedicated top individual fundraising participants: Dane Kanable (Ann Marie and Jason Kanable); Nadia Hrvatin; Lori Alameda; Aldkida Jones-Philbert and Diana Salcedo-Leon. 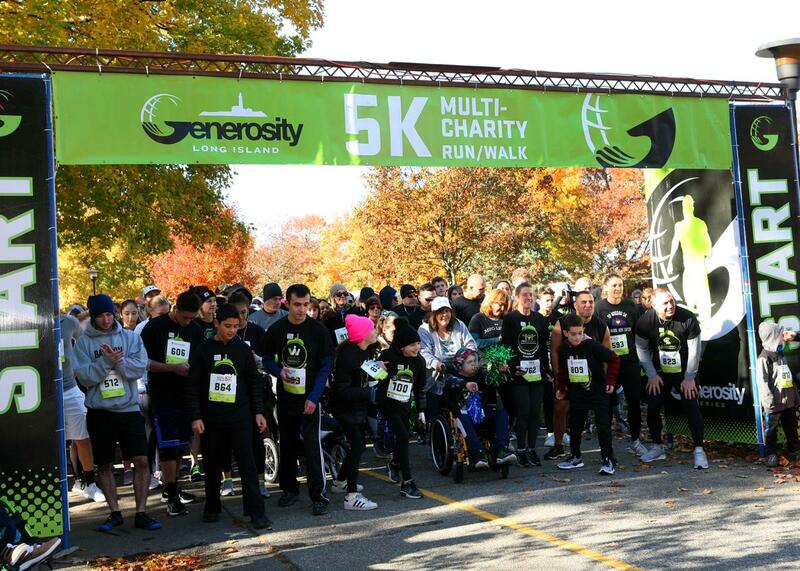 The race was organized by Generosity Series, an industry leading fundraising and racing platform that champions the causes of nonprofits nationally. This year's 5K Race was dedicated to the more than 25,000 families who rely on WellLife Network each year for specialized care. The race also served as an overwhelming testament to the New Yorkers committed to care for and empower their community's most vulnerable population, runners participating from New York City and Long Island. Click here to view photos from our 2nd Annual 5K Run/Walk. “Awesome,” cheered Charlene, one of 95 volunteers who gathered at 13 locations across New York City and Long Island to lend a hand to WellLife Network’s Project Volunteer Day. None are trained horticulturists. They are accountants, lawyers, insurance specialists, financial experts, sales reps, administrative assistants and more. They are people who wanted to give back and who liked to do so in an outdoor environment. They didn’t have to worry about being asked to answer complex gardening questions. Trained staff did that. The volunteers had one common goal – to beautify the residences of WellLife Network through gardening, painting and exterior do-it-yourself projects. 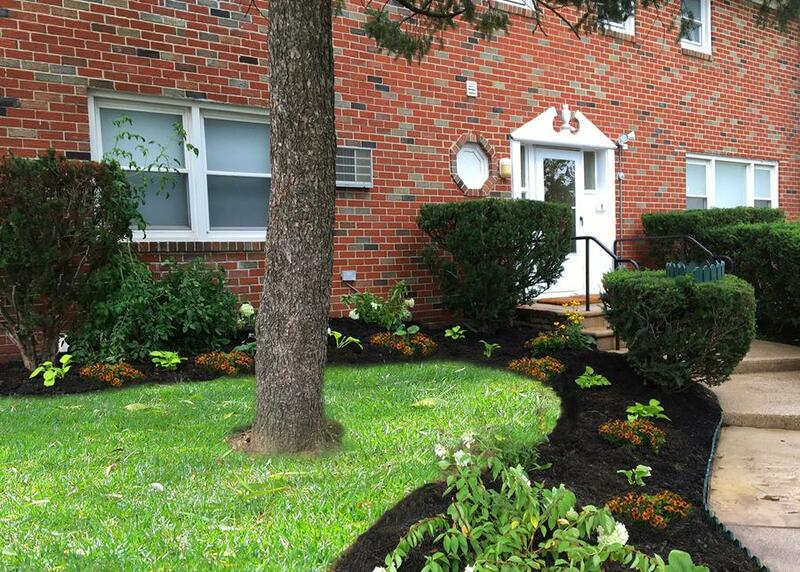 The re-landscaped front entrance at College Point takes on a new elegance thanks to our hard-working volunteers from Mutual of America. Spirits were high as our WellLife Volunteers mulched, weeded, tilled the soil, planted hundreds of perennials and bulbs and spread an amazing 6,400 pounds of mulch at residences for individuals with special needs and mental health challenges. The results were spectacular. Their efforts enhanced the agency’s residential sites and saved dollars for much needed interior renovations. We especially want to thank our corporate volunteers from BDO USA, LLP; Carr Business Systems; Levy Stopol & Camelo, LLP; Lamb Insurance Services; Mutual of America; People’s United Bank and The Home Depot who understand the meaning of giving back. A special “hats off” to Emerald Lawn Care Services, Inc. who prepared the beds and manicured bushes and vegetation at five homes. 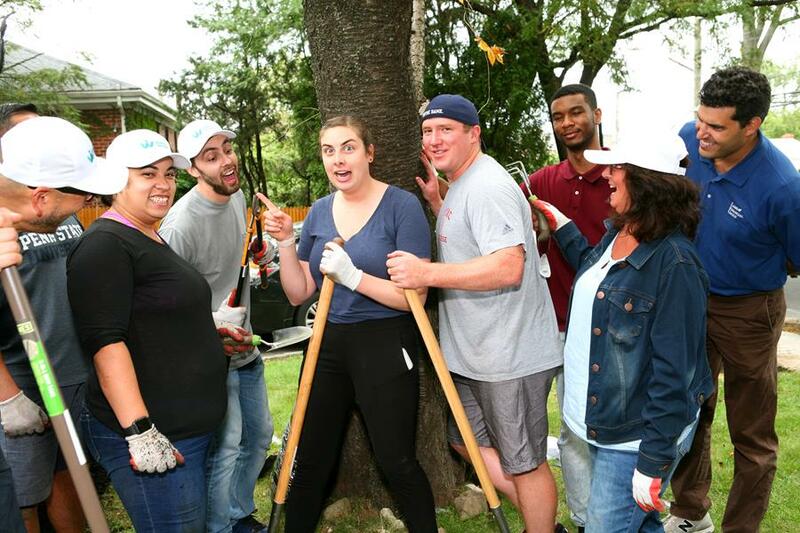 Special thanks to our superb landscapers from Lamb Insurance Services who were given a stern warning by Alexa Santoro (center) to be careful of sharp tools. Also a big thank you to all of our dedicated staff volunteers and our Board Members, Jeff Finkle and Deborah Boatright who sacrificed their back, arm and leg muscles for the cause! WellLife Network is planning a similar grounds keeping event this spring. Join this rewarding project by emailing: Cody.Fisher@WellLifeNetwork.org. Take a few moments to view the photo album and experience the accomplishments of our dedicated volunteers. 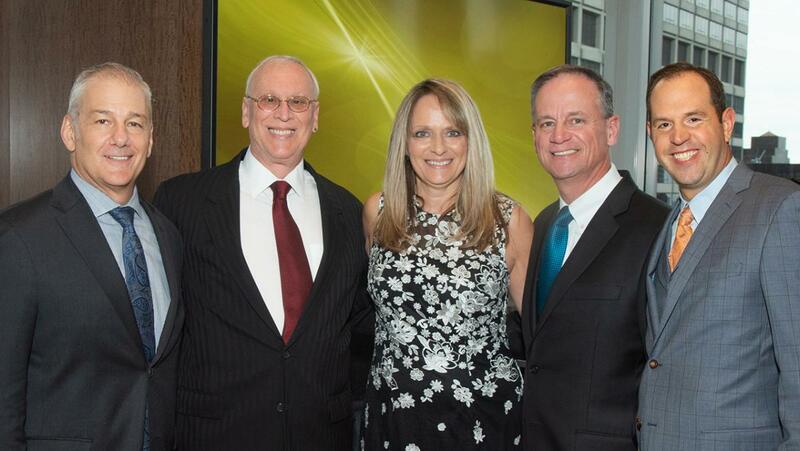 (L-R) Jeffrey Finkle, Board Chairperson; Alan M. Weinstock, CEO, Sherry Tucker, President, WellLife Network; John R. Greed, President and Chief Executive Officer, Mutual of America; and Joshua Lamberg, CEO, Lamb Insurance Services celebrate the 2nd Annual Benefit Gala. “Be Well for Life,” the newly launched theme of WellLife Network, was much in evidence as inspired corporate supporters and community leaders gathered at the agency’s 2nd Annual “Be Well for Life” Benefit Dinner, held Wednesday, June 6, 2018 at the corporate headquarters of Mutual of America, New York City. The event raised more than $350,000 to support WellLife Network’s comprehensive array of health and social services that, each year, helps more than 25,000 individuals and families achieve greater personal and economic independence. “Through the work that we do, thousands of people in need benefit. The many individuals and institutions that support us should take pride in the many ways we are assisting people “be well for life,” said Jeff Finkle, WellLife Network Chairperson. Finkle emphasized the importance of WellLife Network’s ongoing partnerships with government, business, foundations, and the voluntary sectors and the essential role they play in allowing the Agency to provide such a broad and effective range of services. 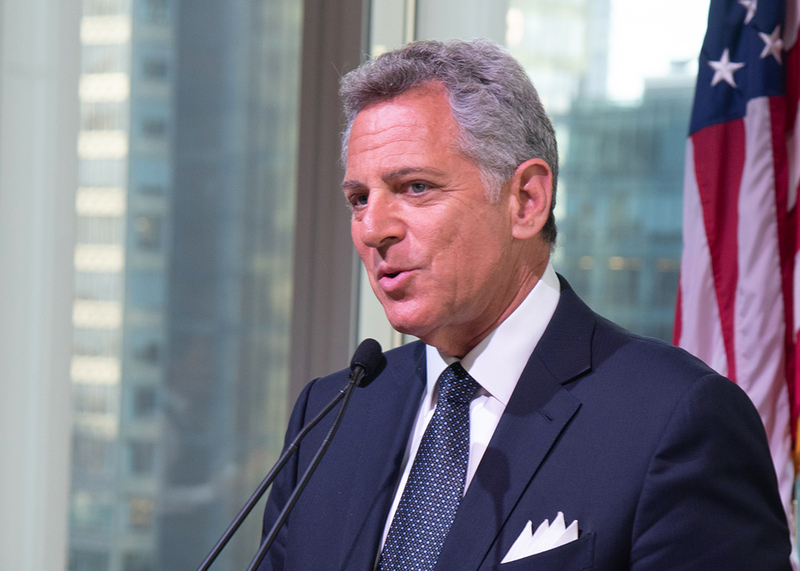 Special guest Bill Ritter, Emmy Award-Winning Broadcaster, WABC-TV News, once again served as host and special guest for the event. 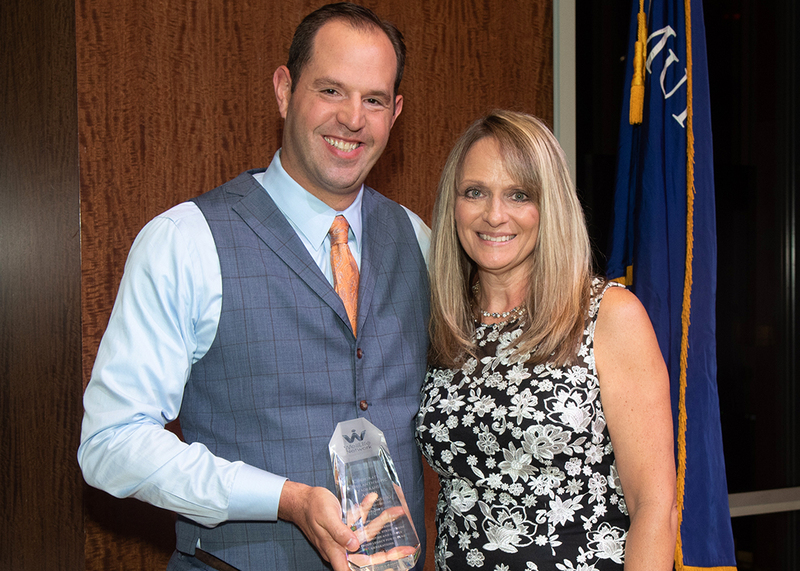 • Joshua Lamberg, CEO Lamb Insurance Services, received the Corporate and Philanthropic Leadership Award. In accepting the award, Mr. Lamberg commented, “This is a special organization, run like a business – a business that changes lives and communities. I am honored to support your brand and mission.” Lamb Insurance Services, one of the largest privately-owned insurance and financial services to human service organizations throughout the United States, provides specialty property and casualty products as well as group health and benefits. 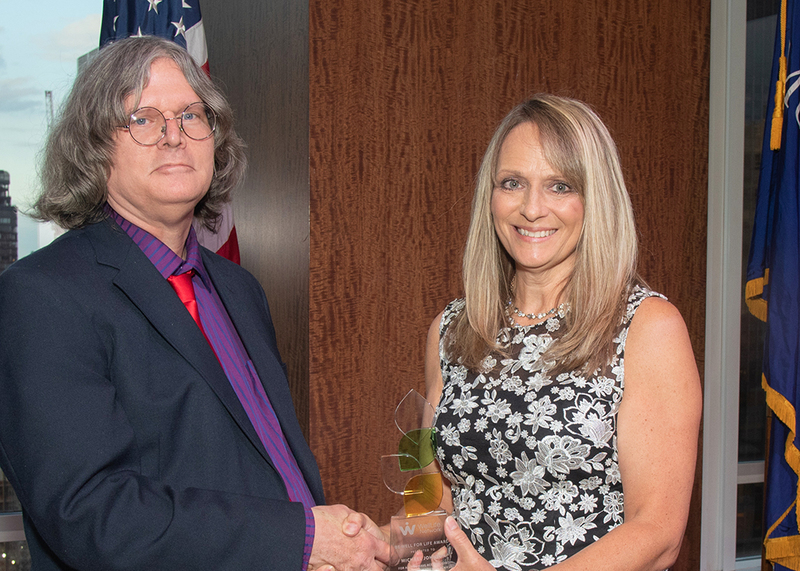 Joshua Lamberg, CEO, Lamb Insurance Services receives Corporate and Philanthropic Leadership Award from Sherry Tucker. • Alan M. Weinstock retiring CEO, WellLife Network, received the Board of Director’s Lifetime Leadership Award. 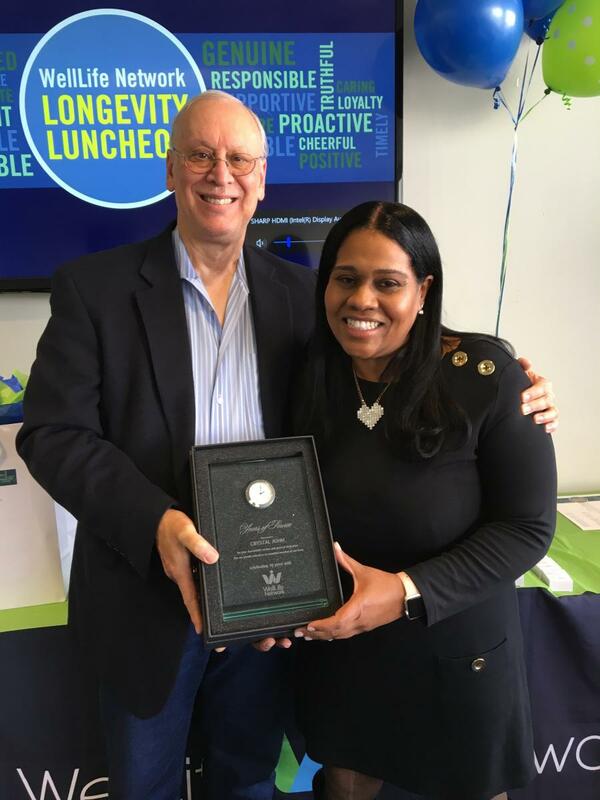 Mr. Weinstock said, “I have enjoyed the journey of helping individuals become more independent and developing an organization which is dedicated to the betterment of all individuals and communities throughout New York and Long Island. He urged the audience to “make WellLife Network a part of your family’s basic values by giving your time, your energy and your financial resources to a cause you believe in." 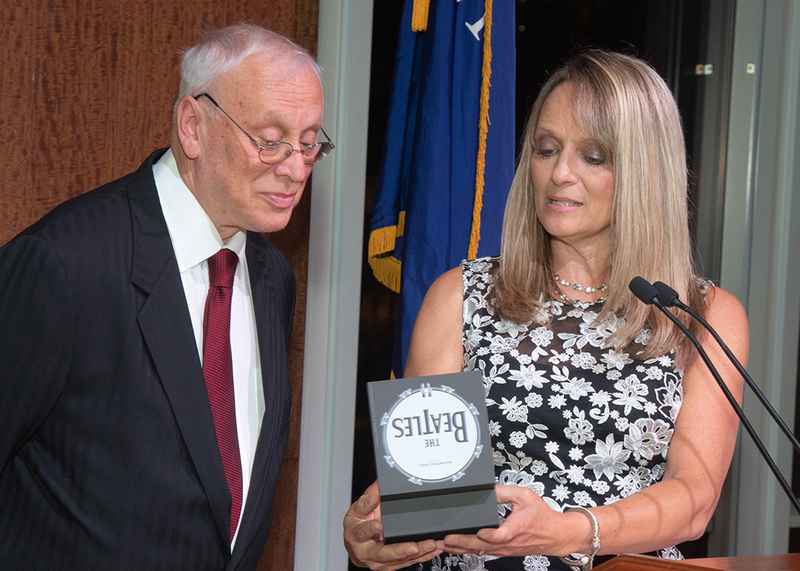 Alan Weinstock, a devout Beatles fan receives a limited edition Beatles watch, from Sherry Tucker, incoming CEO to commemorate his amazing four decade career. Sherry Tucker, incoming CEO, commented on the challenges faced by all health and human services organizations in developing funding opportunities and creative programming. She pointed out that the uniqueness of WellLife is its network of integrated services that addresses the needs of an ever-expanding base of individuals and families. An emotional highlight of the evening included the personal stories of three WellLife Network program participants who have benefited from the agency’s services. Each individual received the Be Well for Life Inspiration Award. 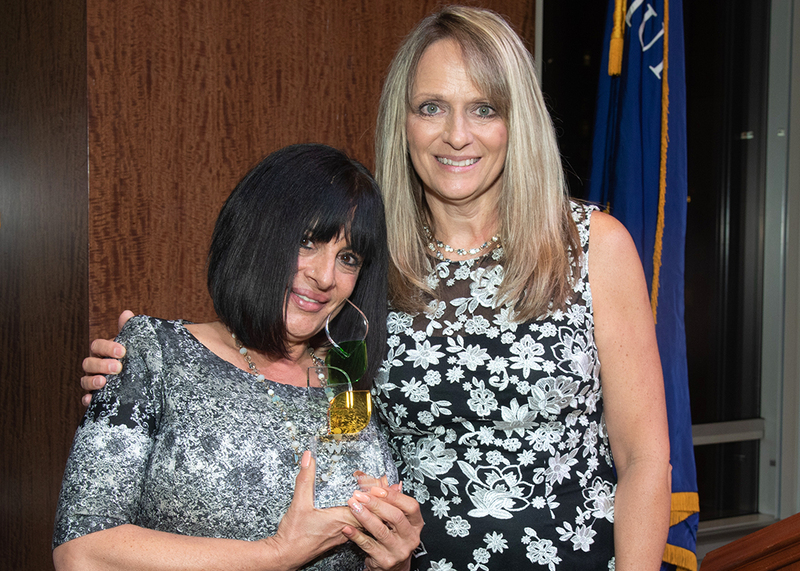 A new tradition began this year as WellLife Network honored two of its staff with the Elaine and Thomas A. Blumberg Staff Inspiration Award, thanks to the generous funding from esteemed board member Tom Blumberg. Sheila McPherson and Lilian Taku were the inaugural recipients of this award for their heroic volunteerism efforts in helping the survivors of the wildfires in California. 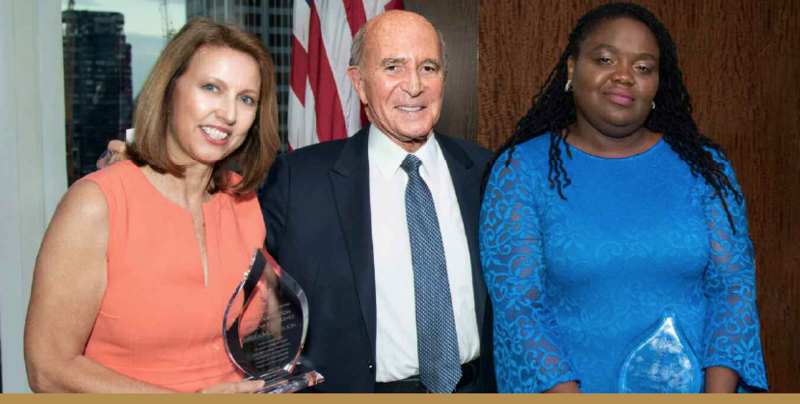 Sheila McPherson, LMSW and Lilian Taku receive the inaugural Elaine and Thomas A. Blumberg WellLife Network Staff Inspiration Award from Tom Blumberg, esteemed WellLife Network Board member. WellLife Network, one of the region’s largest and most diversified health and human services organizations, has touched the lives of more than 1 million people over the past 60 years. Learn more about WellLife Network at www.WellLifeNetwork.org. To view the Annual Gala photo album, click here. Addiction can impact anybody–whether it's your co-worker, neighbor or loved one. Starting pro-active conversations about addiction challenges can be difficult to do though. Where do you start? How do you bring it up? What questions do you ask? 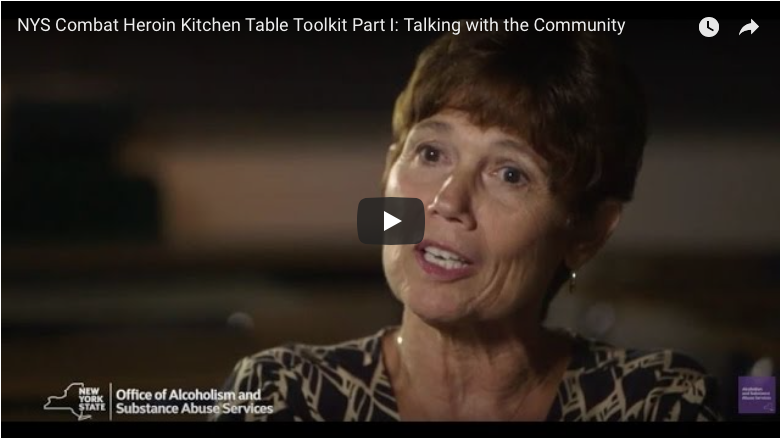 The Kitchen Table Toolkit was developed to assist parents, teachers, counselors and the community with guidance on how to initiate conversations about heroin and opioid abuse. Starting a conversation about addiction can change the life of someone around you. The Kitchen Table Toolkit is a great starting point for getting the confidence you need to get started. If you or a loved one are faced with addiction recovery challenges, WellLife Network is here to help. You can contact us at the number below or visit any one of our clinics on Long Island. The past holiday season is all but a faint memory of family, friends and wonderful meals. But for many children, this holiday season was a hurtful reminder of the challenging times that broken families face during the joyous season. These children have often been subject to conditions no child should experience. Some children face parents struggling with anti-sobriety diseases or that have severe and persistent mental health issues who repeatedly revisit non-compliance and become frequent visitors of an Emergency Room. For others, the future is just as daunting as they awaken everyday with 100 other families, all homeless, all wanting more, yet many having no choice but to endure the cycle and wait. WellLife Network’s Care Coordination team made a difference in the lives of some 70 families through their generosity and outreach of caring. This past holiday season, our 3rd annual Toys for Tots Drive saw more than 160 new and gently used toys distributed throughout Brooklyn, Queens and Long Island. WellLife Network's Care Coordination teams wanted to ensure that we provided a positive holiday experience to the children, even if but for a moment. We also want to thank our generous and caring WellLife Network staff that donated the toys, participated in the gift wrapping and distributed the gifts to those less fortunate this past holiday season. We look forward to putting a smile on even more faces in the upcoming year. 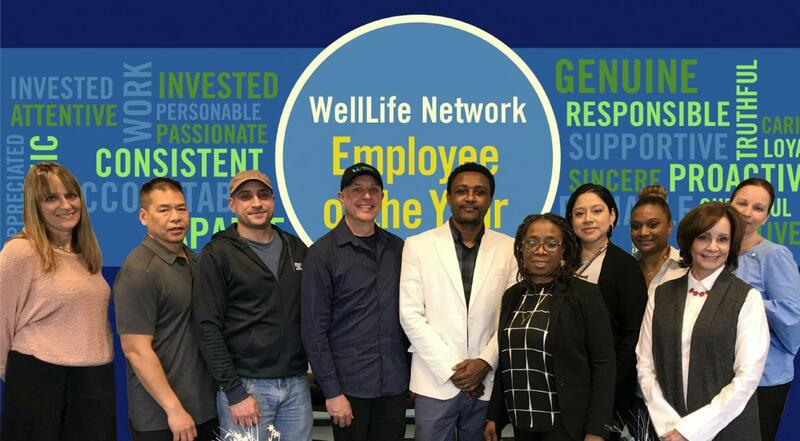 Today, we had the incredible honor of recognizing and awarding 98 of our dedicated staff members for their longevity and their commitment to the WellLife Network mission. Each individual has worked for the agency 10, 15, 20, 25 and 30 years. Collectively, they have brought more than 1,000 years of dedicated service, business insight, expertise, care and professionalism to our programs across New York City and Long Island. 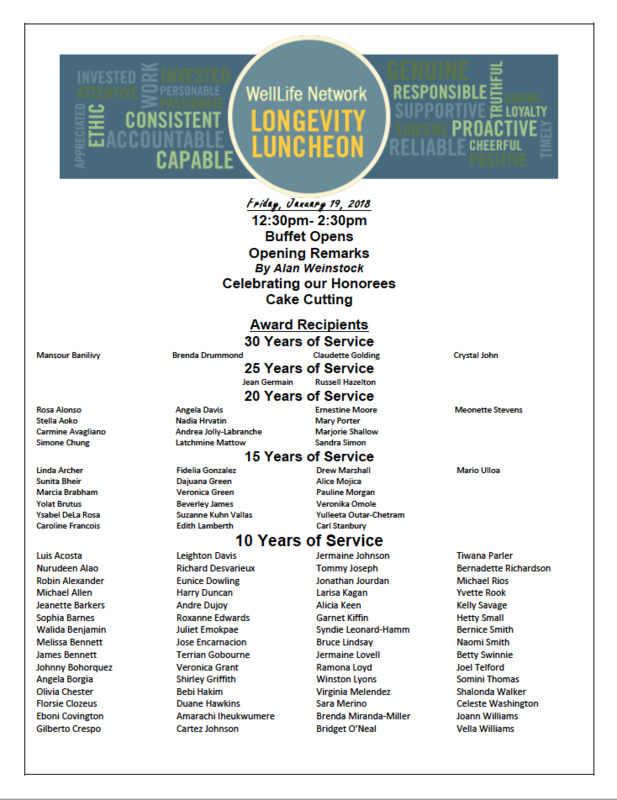 Alan Weinstock, CEO thanked each of the staff members for their loyalty and years of service to the local community. “We are truly blessed to have a staff who believe in our agency, one another and those we serve each day", stated Weinstock. Honorees were given a Certificate of Appreciation and a beautifully detailed badge recognizing their years of steadfast service. Crystal John, Director of Behavioral Health Residential Services said it best by saying, "At WellLife Network, we are all family." Our staff shows that commitment day in and day out as they serve more than 25,000 New Yorkers each year. Join us in congratulating the following staff, who each day empower individuals to lead more independent lives. 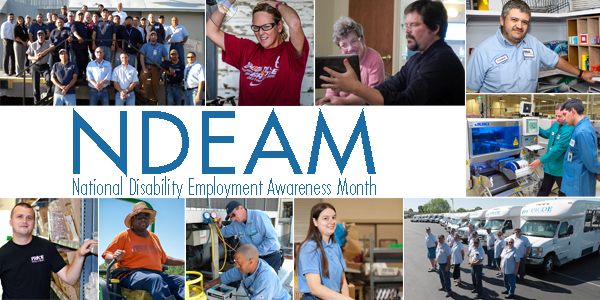 Their talents and skills strengthen our outreach to the communities we serve and demonstrate that as an agency, we truly embrace our mission of helping individuals realize their full potential by achieving meaningful life goals. Sometimes it takes individuals in need to see the need in others. That is what participants with intellectual and developmental disabilities who attend WellLife Network's Day Habilitation programs found out when they raised money to provide holiday meals for less fortunate families on Long Island. 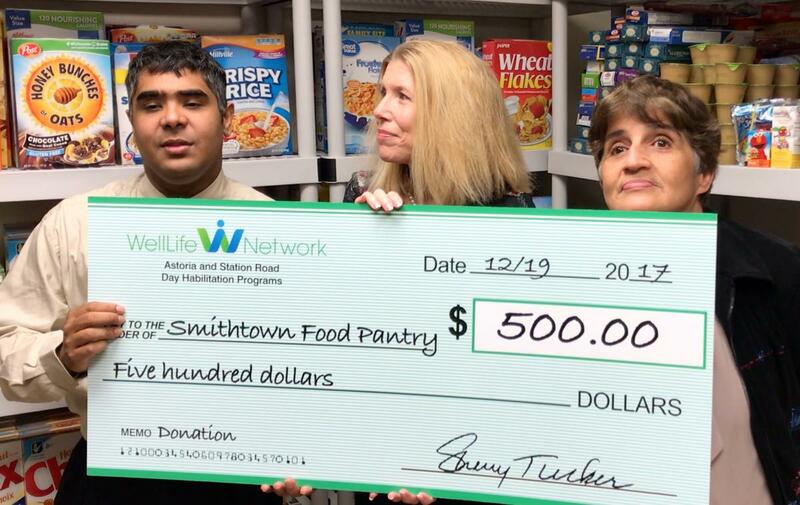 Participants of the Astoria, Station Road and Long Island City Day Habilitation Programs raised more than $250 in support of WellLife Network's Smithtown food pantry. With a matching grant, provided by senior executive staff, the total became $500. Through the sale of baked goods and healthy snacks, some 80 families will receive a nourishing and satisfying meal this holiday season. With contributions from our Board of Directors and generous vendors the total grew to more than $4,500. "We wanted to help people who are hungry. People should not be hungry during the holiday," exclaimed Maria, a participant at the Station Road program. "We want everyone to have a great holiday!" The WellLife Network Day programs assist individuals with intellectual and developmental disabilities in learning basic life, socialization and prevocational skills through structured activities and volunteering in the community. The check was presented to Carolyn Dornstauder, Program Director, and Rebecca Costa, Vice President, Long Island Operations on Tuesday, December 19, 2017. This WellLife Network pantry is one of four located in Suffolk County. Each year, some 5,000 people receive groceries and toiletries from our pantries in Huntington, Smithtown, Wyandanch and Coram. The event was covered by Kristin Thorne from Channel 7, WABC Eyewitness News. Working in cooperation with Long Island Cares and Temple Beth David, WellLife Network will provide a traditional holiday meal for a family of our, including: turkey, mashed potatoes, vegetables, dinner rolls, cranberry sauce and a delicious apple pie for dessert. Join the WellLife Network who takes care of one another by clicking here to make a donation today! 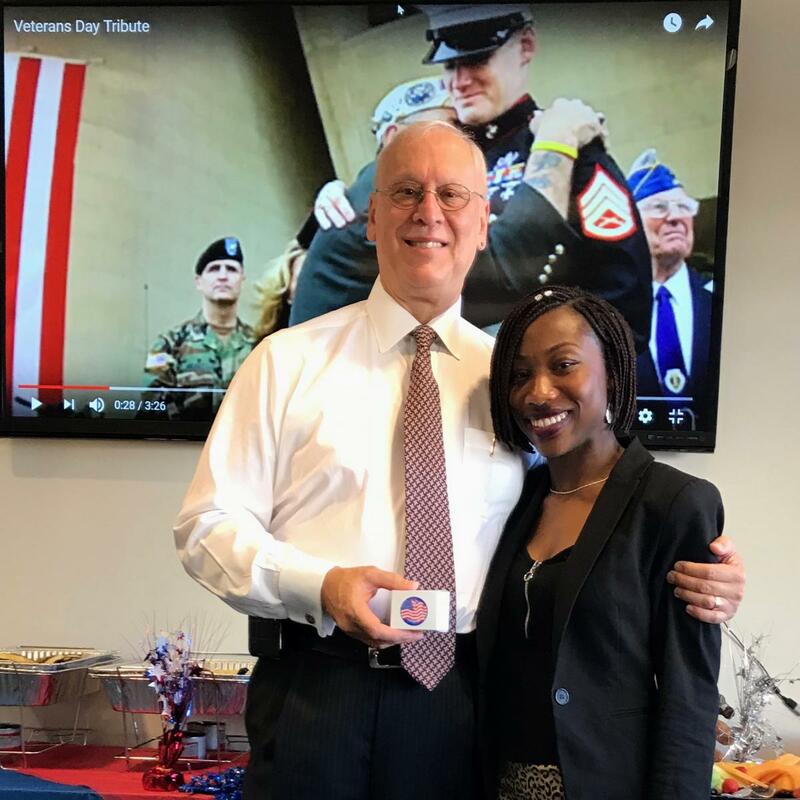 Today, we had the privilege of hosting WellLife Network’s annual Veterans Day Appreciation Breakfast—in honor of all the veterans who have defended our country, our values and our liberty. 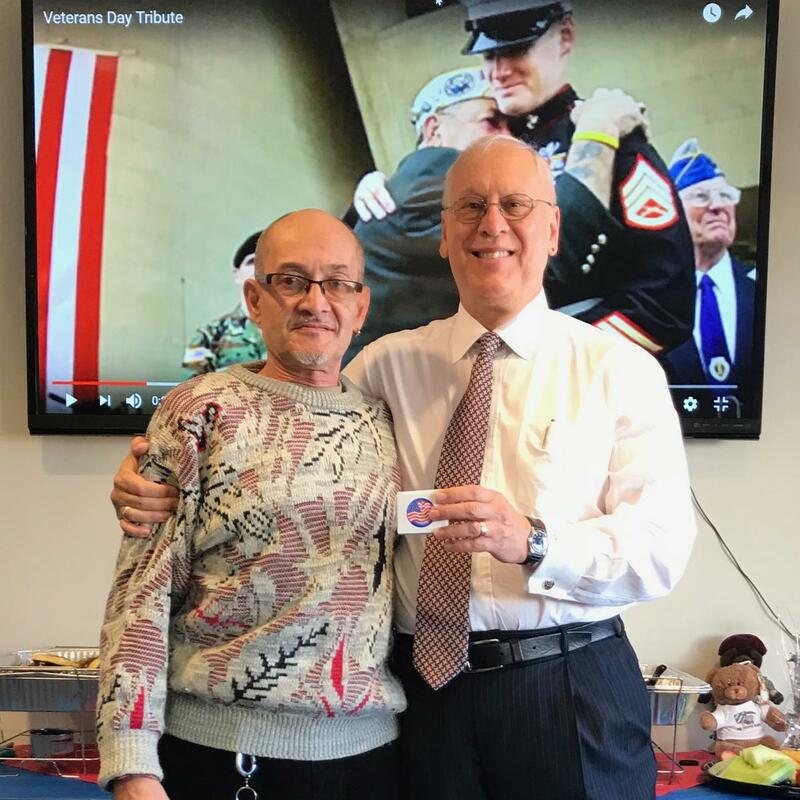 WellLife Network is proud to live out that mission through the implementation of Operation Vets, a nationally recognized program that now employs more than 30 Guardsmen, Reservists, transitioning Service members and Veterans across New York City and Long Island. 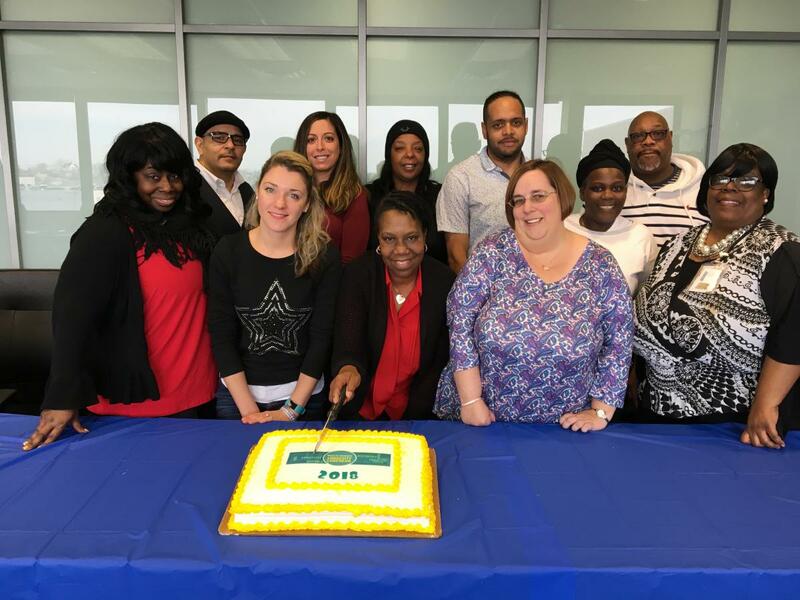 Thanks to their ongoing service and sacrifice, they remain on the front line of social change here in our community as they help WellLife Network deliver essential services to more than 25,000 New Yorkers each year. WellLife Network is also proud to serve veterans directly who are faced with mental health challenges and addiction recovery challenges. Whether it’s through providing counseling, housing or mental health support, we consider it one of our greatest privileges to take care of the veterans, and their families, who have sacrificed so much. We recognize the value and skills that veterans continue to bring to WellLife Network and to our surrounding community. This Veterans Day, we salute them for their service.